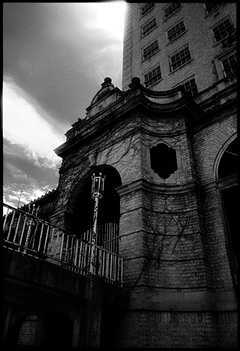 Haunting Photos of the Baker Hotel, Mineral Wells Texas. 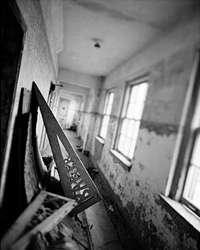 It has never been adequately explained how buildings - especially vacant or abandoned buildings - affect us. But they do. The word nostalgia comes from two Greek words: nostos - meaning to return home - and algos - denoting pain. But even foreign buildings or buildings we've never seen can cast a spell on us - sometimes from just seeing a photo or examining an engraving. While it cannot technically be "homesickness" - for those of us who experience it - it's the next closest thing. 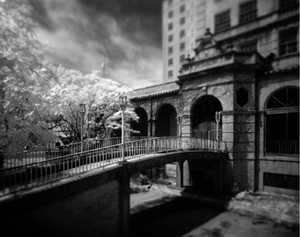 Jason Grant is a Dallas based photographer who captures images of historic ruins. These include some of the more inaccessible buildings and structures in Texas - and many more in the former Soviet Union. Grant is a realist and doesn't entertain false hope or dreams that these structures will all be restored. He sees their decay as a natural, inevitable process and feels that "these palaces give a much more tangible sense of history in their vacant, neglected state than if they were meticulously restored museums." A visit to Jason Grant's site: www.nostalgicglass.org will bring you to these places seldom seen. You can take a tour of fortresses, castles and estates in Russia - or visit the interiors of the Nueces County Courthouse or the Baker Hotel as well as a WWII airfield and the Matagorda lighthouse. The rich photography is accompanied by brief but explanatory captions. The section marked History will say a few words on the photographer's philosophy toward these buildings and structures. In Mr. Grant's own words: "I hope that my project will give some of these estates a chance to say a few last words about themselves before they slip away, to be remembered as the grand structures they�ve always seen themselves as." 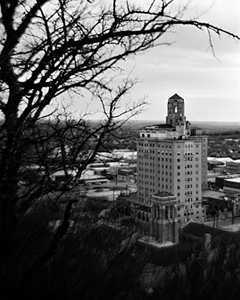 The Ghosts of the Baker Hotel by Bob Hopkins.